What’s red white and blue, sometimes it is hoisted up one or two of the flag poles on the roof of Ohio’s statehouse, and oh yes, it’s not a flag? 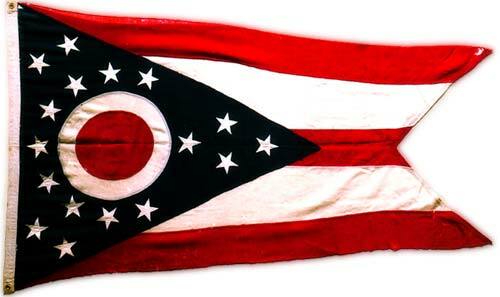 On this day in 1902 the Ohio General Assembly enacted a bill authorizing the adoption of a new state flag. Till this day in Ohio history, Ohio did not have a state flag. Ohio had been a state for almost 100 years, but we had never taken the step of creating a state flag. But a year before this date, several historic events came together in such a way that the General Assembly felt compelled enough to adopt a new symbol for the Buckeye State – and those events happened in another state. That state was New York where in 1901 the Pan-American Exposition was being held in Buffalo. The Exposition was a show place for countries from both North and South America. It also included exhibits from many states including Ohio. As part of the Ohio Exposition building, flew a new pennant designed by a Cleveland architect that he felt help draw attention to the building. In 1900 Cleveland architect, John Eisemann, was the winning bidder for designing the Ohio Building for the 1901 Pan-American Exposition. Realizing that Ohio did not have an official flag, Eisemann went about creating a special flag to fly over the Ohio Building. It’s not clear whether Eisemann intended his creation to become Ohio’s flag or not. What he did want was something unique to fly over his building design. 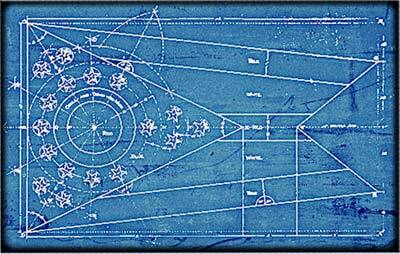 He even patented the flag with the U.S. Patent Office on July 23, 1901. 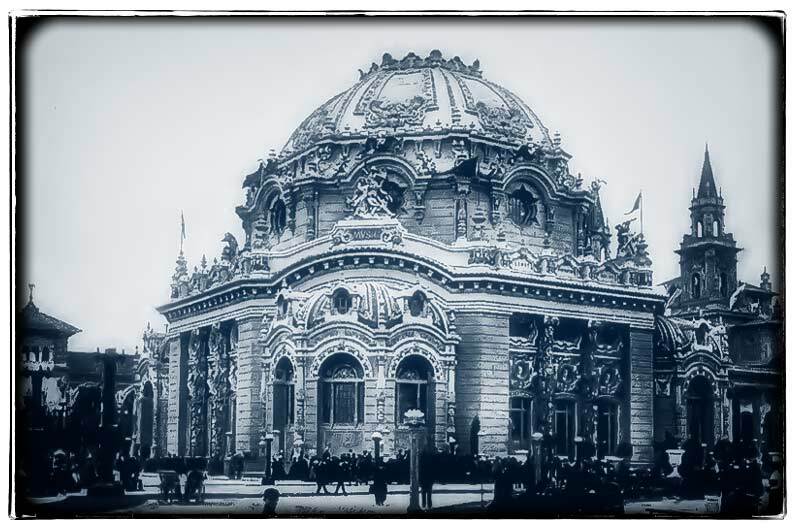 In 1900 Cleveland architect, John Eisemann, was the winning bidder for designing the Ohio Building for the 1901 World’s Fair called the Pan-American Exposition. Realizing that Ohio did not have an official flag, Eisemann went about creating a special flag to fly over the Ohio Building. It’s not clear whether Eisemann intended his creation to become Ohio’s flag or not. What he did want was something unique to fly over his building design. He even patented the flag with the U.S. Patent Office on July 23, 1901. The Pan-American Exposition ran from May 1, 1901 to November 1, 1901. During those 6 months more than 8,000,000 visitors would pass through the gates each paying 25 cents for admission. Besides the debut of what would later become Ohio’s state flag, the fair also had a more tragic Ohio connection. On September 6, 1901, former Ohio Governor, former Ohio Representative, and current 2nd term President of the United States, William McKinley, was assassinated at the Pan-American Exposition. He would die just 8 days later. 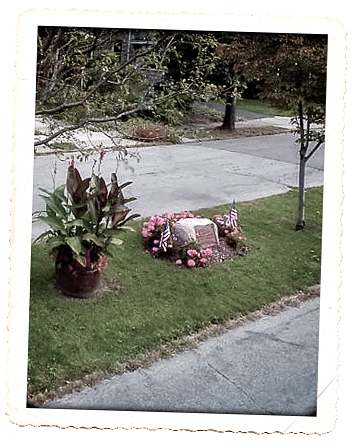 In the following months and years after McKinley’s death, Ohio pay tribute to the fallen leader in various ways. One of those was the adoption of a special scarlet carnation worn by McKinley throughout his political career. Known as the Lamborn Carnation, the carnation became known as the “scarlet carnation” and three years later it became the official state flower as a “token of love and reverence to the memory of William McKinley”. Original flag that flew over the Ohio Building at the Pan American Exposition. The other was the adoption of the flag that was flying over the Ohio Building when the president was shot. Less than 8 months later, that flag would officially be adopted as Ohio’s flag which has been flying over public buildings since this day in 1902. The Ohio state flag is the only “flag” of all the 50 state flags, that is not an actual flag. It’s really a swallow tail burgee, which means it is tapered like a pennant, but has the tip notched with a v-shaped cut out. The only other place the swallow tail burgee is commonly seen is on sailing ships, commonly seen on Lake Erie. Ohio Statehouse with William McKinley Statue. 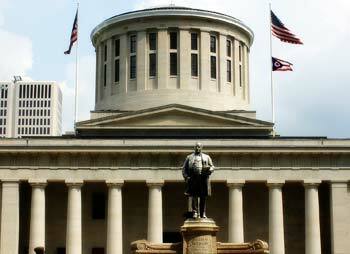 The flag was used as a “communication tool” long before telephones, email and mobile devices, the Ohio flag is raised over the Statehouse when the corresponding legislative chamber is in session – raised on the north flag pole during Ohio Senate sessions and on the south flag pole during Ohio House of Representatives sessions. In the above photograph, the House of Representatives would be in session. President McKinley delivering his speech to the exposition fair goers on September 5, 1901. In the crowd directly below him stood Leon Czolgosz. For the past few days doctors feebly suggested the President might pull through. Newspapers were giving 2 hour updates of his temperature and heart rate. These reports were being posted on bulletin boards throughout the country wherever a telegraph office was located. On Thursday everyone was hopeful. McKinley told his fretful wife Ida. Suggestions that it would have been better to have taken him to a hospital were scoffed at by the medical professionals in Buffalo. He is getting the best possible care here at Milburn House. “The president will recover,” said Dr. McBurney on Thursday. Dr. McBurney was one of several doctors attending the wounded president 24 hours a day. In Washington D.C. plans were being made for a great celebration upon the President’s return to the capital. A great parade will be conducted from the railroad station up Pennsylvania Avenue to the White House. The special train will be outfitted to transport the president once he is healthy enough for travel, but will be expected to travel slowly so as to not overly tax the President’s strength. Officials that had gathered at Buffalo once they received news of the shooting on September 6, began departing on Thursday when it appeared that McKinley would make a full recovery. On Friday evening (yesterday) there was an unexpected down turn in McKinley’s health. The President slipped into unconsciousness. Oxygen was administered. Some time elapsed before the President opened his eyes again. He motioned to someone to come closer and whispered “Mrs. McKinley.” Ida was brought in but he had again lost consciousness. Knowing the First Lady’s unsettling manner of collapsing when faced with agitation, the doctors suggested she be taken outside the room again. Again the President opened his eyes, and again whispered “Mrs. McKinley?” and again she was called back. This time a chair was pulled closer to her dying husband. She sat down and clasped her hands around his. Across the country newspapers had for several days been printing the President’s biography telling his life story, his accomplishments both in and out of office. Everyone already knew he was born in Ohio, had served in the Great Rebellion and had been governor of Ohio. They wanted to know the personal stories of people that knew the President before he was president. Stories of how even as a boy he displayed his intellect and was able at 16 to help support his family by taking on a job as a district school teacher for $25 a month. Accounts involving McKinley and the Great Rebellion were plentiful and how, when the war came, he was one of the first to enlist as a private. A few days after his enlistment, he, like so many other Ohio boys, boarded a train for Columbus. Here they gathered at the new Goodale Park until there was no room and no trees left. They then marched over to Camp Chase where McKinley became part of Company E of the 23rd Ohio regiment. The sprawling fields at Camp Chase were dotted with 100s of canvas tents supplied by the state. Here at Camp Chase which would in a few years become a confederate prisoner of war camp, among these 1000s of boys and young men, William McKinley’s intelligence was noticed and he was promoted from private to commissary sergeant and put on the staff of another future president, Rutherford B. Hayes. After the war, Hayes would be McKinley’s mentor and political adviser. McKinley’s bravery at the Battle of Antietam was noticed by Hayes who wrote to Governor Todd of Ohio, who then responded by ordering his promotion. By the time McKinley was mustered out of service in 1865, he had become a Major, a title he held dear and honored to have achieved. As he told an old friend who asked what he should call him now that he was President of the United States. McKinley replied “You must still call me Major McKinley, for I won that title. These other titles are only temporary.” His wife would also call him Major. On this Saturday morning in 1901, the 39th President, the 6th president from Ohio (3 of whom died while in office) would die in his bed at Milburn House in Buffalo, New York. 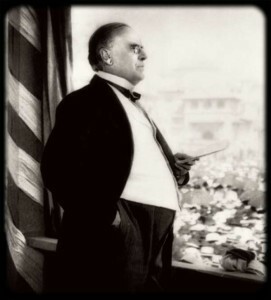 Just before his death, McKinley whispered to his wife “God’s will, not ours, be done.” Ida McKinley, his most fragile wife of 30 years whispered back “For his sake, For his sake,” as she clasped both of his hands. The gates at the Pan-American Exposition where the President was shot on September 6, were closed today and would not re-open until Monday morning. Twenty years later a new housing development would cover those same grounds once occupied by the Pan-American Exposition and a large stone would be place where the Temple of Music once stood. It still stands there today. What’s red white and blue, sometimes it is hoisted up one or two of the flagpoles on the roof of Ohio’s statehouse, and oh yes, it’s not a flag? 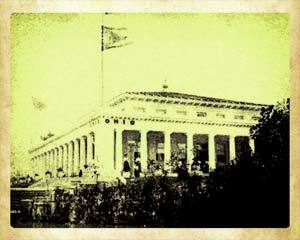 Ohio Building with the original flag flying overhead at the Pan American Exposition in Buffalo, NY. 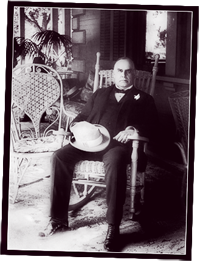 President William McKinley sitting in his rocker, wearing a Lamborn Rose in his lapel. This was going to be a good day for the president as he dressed himself in his bedroom at the Milburn house. The had not yet risen, but he could see the sky brightening to the east that it should be great day weather-wise. Ida was still taking her time rising, but she could see her beloved husband was already dressed. As he turned to her as he always had throughout their marriage, he brought his hand up to his lips and casually tossed her a good-bye kiss. “Be back soon,” he whispered. The rest of the household including his security detail had not yet taken their positions. This was the time of day that William enjoyed the most. He could stroll down the walk and hardly see a soul. It was just him the beauty of the day wrapping itself around him. The President and First Lady leaving Milburn house for their trip to Niagara. Across town Leon Czolgosz was also finishing up dressing. He straightened his string tie, then slipped into his suit jacket. The room’s small mirror didn’t allow him to get a full length view of himself, but it was big enough for him to straighten his hair before tucking a white handkerchief neatly into the jacket’s pocket. He glanced over at the dresser at the new 32 caliber revolver lying there. He and that pistol had already come twice within a stone’s throw of the president. 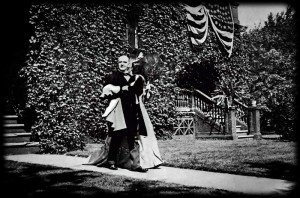 After his walk around the upper-class neighborhood, McKinley returned to the Milburn house. Ida was up and cooking breakfast for the two. The smell of a fresh pot of coffee drifted through the house. Today they were just going to have a healthy portion of omelets dressed up with a little cheese and some fried potatoes. They were going to have a big luncheon at Niagara Falls later that morning. Leon didn’t have breakfast this morning when he left the hotel. He did buy a new cigar. The paper had said the president would be leaving this morning sharply at 9:00 a.m. by train so he could see the new power plant at Niagara Falls, and of course the falls. He and Ida walked down the Milburn sidewalk to their waiting carriage. There was already a large crowd gathered, a reporter snapped a photo of the couple. By the time their carriage reached to the waiting train it had already passed by Leon as he too made his way to the station. Leon followed the president to Niagara, but after spending a little time there, he decided he would never get close as close as he thought he needed to be. Leon returned to Buffalo. He would wait for the president to come to him. 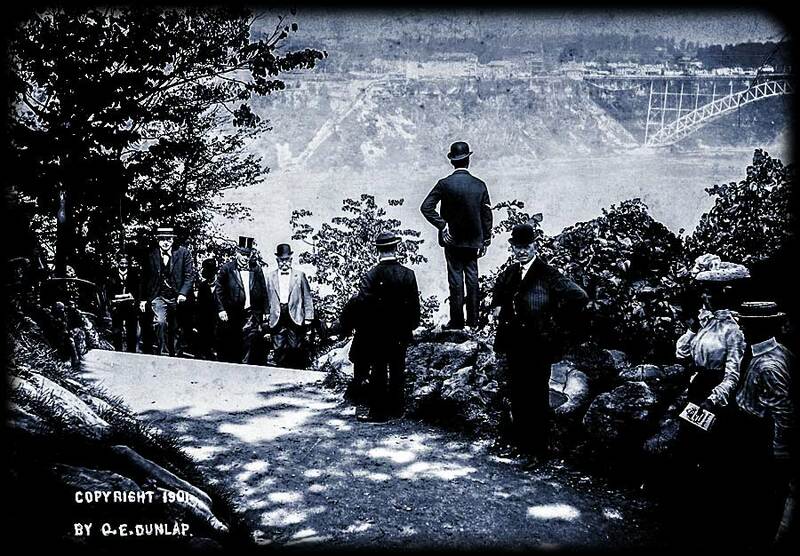 The president viewed the American and Horseshoe Falls from the Upper Steel Arch Bridge, then visited Prospect Park and Goat Island. They then went to the International Hotel for a luncheon and then took a carriage drive to the power house for a complete tour of the electrical machinery and dynamos. It was all very exciting for the president and he immensely enjoyed every moment. By mid afternoon it was time to leave. The Pan American Exposition architectural theme was called the Free Renaissance style, which just meant that the architects designing the exhibits should make sure they incorporated elements from European buildings popular a few centuries ago. The Temple of Music was a spectacular building that served as the concert hall for the Pan American Exposition. It cost more than $85,000 which would almost $2 million in today’s dollars. The Temple of Music could be called the epitome of Free Renaissance style. It’s ornate style overwhelmed the eye; its symmetry screamed Renaissance and at night all of its architectural features were emphasized with electric light bulbs. Each afternoon 2,000 people would fill the great domed auditorium to listen to the largest pipe organ ever built in the United States. The sounds of that organ would vibrate clear through body (the organ is now in a Catholic church in Buffalo). After returning from Niagara, the president went straight to the Temple of Music while Ida went back to Milburn house to rest. The reception at would be the crowning event where visitors to the exposition could actually shake hands with the most popular president in recent memory. Earlier that day in local papers there was a brief news item from Copenhagen that said Emperor Nicholas of Russia would have loved to visited Paris, but his security detail persuaded by “fears of an Anarchist outrage” convinced the Emperor not to make the trip. 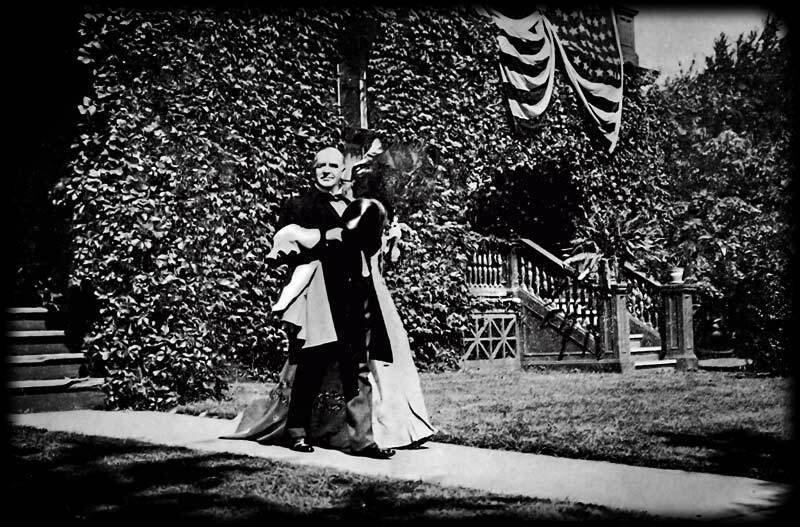 In Buffalo there was no such warning announced in the paper, but President McKinley’s secretary, George Cortelyou had strongly suggested he not to do the Temple of Music reception. 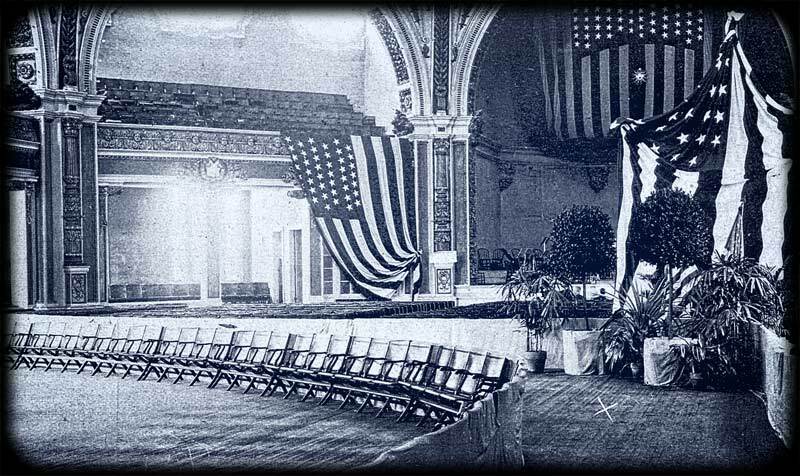 In fact the secretary had taken this event off the schedule twice, and both times McKinley personally put it back. Anarchists as they were called, had decided that capitalism and the authority powered through capitalism could only be controlled through violence. Violence was the only way of giving the power to the people. In a few years, the Anarchists would be replaced after the overthrow of the Russian Emperor Nicholas by the Bolsheviks, a modified form of the Anarchists. Leon Czolgosz was an Anarchist. He had studied in great detail previous assassinations and murders. He was well educated in the Anarchist methods and reasons, and he knew that on this day in September, he would join his brethren in making America a better place for the working man. The line had beginning to form outside the Temple of Music since lunch. Among those at the head of the line was Fred Nieman. Later people standing in line with Fred said he had no interest in making small talk, or even complain about the extraordinary hot day they were experiencing. Fred Nieman was the name Leon Czolgosz used when the hotel manager questioned him after he signed John Doe to the registry. Later that day when police began their questioning, he would use the name Fred Nieman. It wouldn’t be till later that his real name became known. Very close to 4:00 p.m. word began spreading through the visitor line that someone had seen the president’s carriage. In fact, the president had arrived, and he was escorted in through another entrance where he quickly took his designated place. McKinley gave the go ahead for the procession to begin. Leon Czolgosz was not first in line, but he was near the front, with maybe 10 or so in front of him. As they got closer, the security increased, but no one said anything about Leon’s right hand perpetually tucked in his coat pocket. Security was watching the man in line just in front of Leon. They would later say that he had the look of an Anarchist and when he wouldn’t let go of the president’s hand, security became even more alarmed and forced the man to move. It was a tense moment and all the security detail must have felt relief when the Italian looking immigrant moved on. No one seemed concerned about the small framed, neatly dressed man next in line. Leon had gone through all the mutations of how to approach the president, how to cover his hand that was holding the pistol. How to ignore the handkerchief wrapped around his hand if it caught fire from the first gun shot. Squeeze the trigger once, twice and maybe three times and then run. Leon got off two shots as he looked at the large man in front of him eye-to-eye before anyone understood what had just happened. The president stepped quickly stepped backward as a result of the gun flash and the loud retort. A large black man standing behind Leon saw the muzzle flash and reacted almost instantly by striking Leon in the back of the neck with one hand and simultaneously grabbing his gun hand to prevent another shot from being fired.. Then a crowd of security and well-wishers descended upon Leon. In just moments Leon was being pummeled by fists. Temple of Music, September 6, 1901. “X” marks the spot where the president was standing. The president had stepped back with his arm across his chest holding on to his waist coat and could see the melee in front of him. “Don’t let them hurt him,” he shouted loudly. Along side the president was Secretary Cortelyou, John Milburn, and Detective Geary. Not yet realizing the full impact of what had just happened, they stood motionless. They urged the president to sit down, but he told them to just remain calm. No need to alarm the public any more than they already were. “But sir, you’re wounded,” Cortelyou said. “No, I think not,” said the president. “I’m not badly hurt…” Nevertheless they managed to get him seated. Only upon pulling back his outer layer of clothing did they see the spreading blood stain. Leon was quickly ushered out of the hall and into a side room. From here he was taken to the Buffalo police station where he was questioned. Police were convinced Leon had help and they were determined to find those individuals as quickly as possible. They could not be certain how deep this plot went or who the next target would be. Security for Vice President Roosevelt were immediately wired to take extra precautions. The president was taken by an electric ambulance to the the Exposition hospital. However, the only personnel on duty were some nurses and interns. They did begin advanced first aid on the president. Meanwhile word went out to find a qualified doctor. McKinley had two wounds: one was a minor wound to his right chest caused by a ricocheting bullet. The other wound was to his abdomen. McKinley had found the ricocheting bullet in his clothing during the brief ambulance ride. The other bullet was still lodged inside. The examination room was not suited for surgery, but none the less the doctor and nurses tried to find and extract the second bullet. They first gave the president a morphine injection. Then an extensive exploration for the second bullet was conducted. They could not find that bullet and after determining there was no internal bleeding, they stitched up the president and the president was driven back to the Milburn house which now had armed guards protecting it. The president would rest comfortably at Milburn house for the next several days. Doctors would come and examine him and ask how he felt. Occasionally, the president would receive additional morphine injections. For the next week the president would gradually improve until the September 13, and then everything changed dramatically. Having seen the president disembark from his train yesterday, Leon understood that his chances of being close enough to the president were slim. Once again the newspaper gave him all the information he needed. Hundreds of eager fans had gathered around Milbourn House on Delaware Street hoping to catch a glimpse of the President as he departed for the exposition. Thousands more lined Lincoln Parkway all the way to the exposition. It had been announced the president would arrive that morning and give a planned speech. Remembering the strong security and the excitable crowd, Leon Czolgosz decided to forgo being in the right place at the right time and instead just go directly to the exposition center and take a position where he knew the president would arrive at some point this morning. Leon Czolgosz had arrived early, long before the president had left Milbourn House. He easily found the flag draped podium and made his way there. Few people had yet gathered, but Leon was ready. As the cool morning hours began to warm, Leon could hear the crowd outside the stadium begin to cheer. Everything had been going in slow motion up to then. Now suddenly John Milbourn had stepped up to the lecture and announced to the crowd “Ladies and gentlemen, the President of the United States.” And there he was, almost right in front of him but 20 feet higher. Again Leon had misjudged. If he could take his shot the chances would be that he would miss. The angle wasn’t right, he was too close, but would he have a better chance? His mind raced through the different scenarios. His hand clutching at the revolver in his pocket. A woman next to him decided to get a better view, jostling Leon and she moved. Leon looked at her in disgust and muttered something no one heard. And then, it was over. The president had already folded his speech and put it in his frock coat pocket– waved at the crowd and stepped back and was out of sight. Another fruitless day. Leon was frustrated knowing that the rest of the president’s day would be spent in events around the fair. There would be no further opportunity today. Leon made his way back to the hotel, ordered a whiskey and went to his room. Later that day, the president would pose for a photograph along with a number of dignitaries. It would be the last posed photograph that would be taken of him. 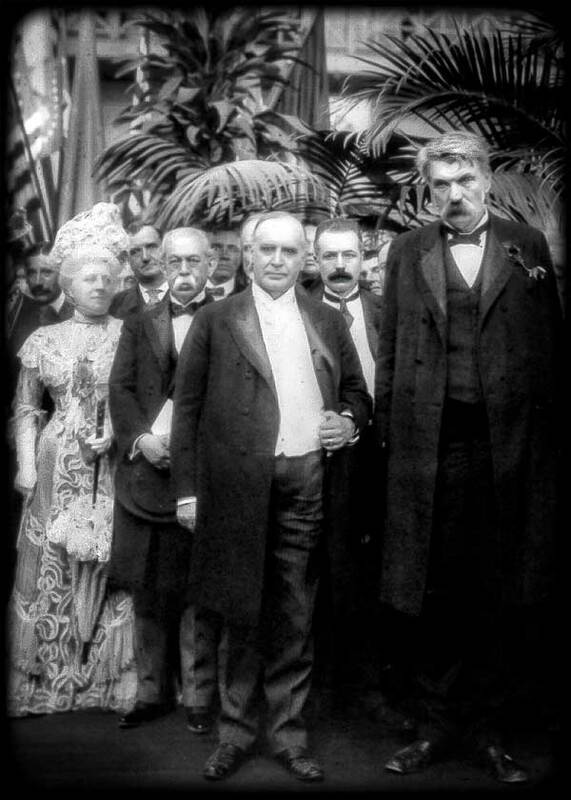 From right to left: Colonel John H. Bingham (the tall gentlemen) of the Government Board, just behind the colonel and the president is George Cortelyou, next is the president, just to his right is the Mexican Ambassador, Manuel Azpíroz, and next to the ambassador is Mrs. John Miller Horton, Chairwoman of the Entertainment Committee. In between the ambassador and Mrs. Horton and just behind them is John G. Milburn, President of the Exposition.